This was the first Transformice’s event! Mice could fly across the map 666 on a broomstick and tried to catch the cheese, which teleported randomly on the map. One mouse was randomly turned into a bat and had to infect the other mice by touching them. Mice could “meep!” by pressing spacebar to repel bats and bats couldn’t get the cheese.This map was the first side-scrolling map. Some presents were scattered about the vanilla maps and mice had to gather them by completing the map with the present. These gifts could be given to the other mice or could be exchanged for items on map 888. Snow was also introduced for the first time during this event and mice could throw some snowball by ducking. Like the old christmas event, presents were featured on vanilla maps and by clicking them mice could unlock a new special item, a random item from the shop, a cheese or nothing. Mice could also kiss the other mice under the mistletoe to unlock some titles. Grass grounds also became snowy grounds and many decorations had snow on them! But that wasn’t the only new addition! A special map (800) could appear randomly and all mice had shaman abilities and were also dressed up as Santa. One mice was randomly turned into a cupid and had to throw arrows at 3 mice to make them pink. These three mice could exchange gifts with the other pink mice and received gifts from the others. Mice unlocked titles by giving presents to each other. This event’s special map was also a scrolling map. 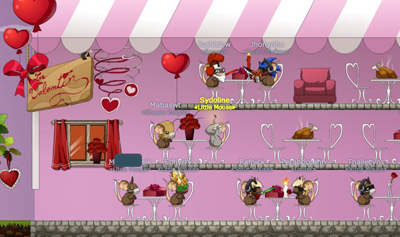 At the end of this map, mice entered in a romantic restaurant and could click on one of the chairs to sit on it. Kissing the mouse in front of you 4 times would give it a present. Also known as Fishing event, this event consisted of fishing on the map 777. The reward was a new item or a simple cheese. Mice could win 2 items per aquarium available. As the the christmas event, eggs were located on vanilla maps and mice had to gather them by completing the map with the egg. Items were unlocked from 10 to 300 eggs, and they could be regular or new shop items. On this special map (555), mice had to throw some confetti by pressing E to unlock items. The map has now been removed like all the other special maps but mice are still able to throw confetti in game!